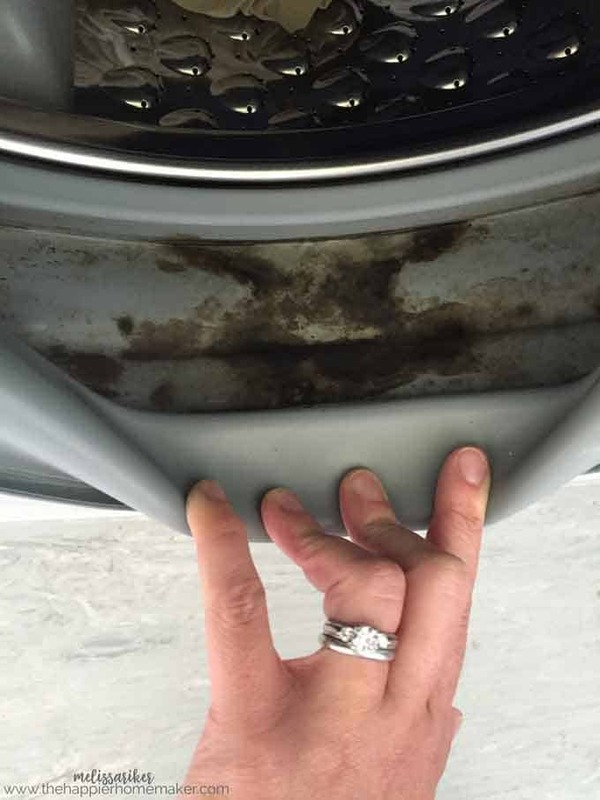 Front load washing machines can easily build up mold and mildew in the rubber seals. Learn how to clean and sterilize your front load washer the easy way with this step by step tutorial! 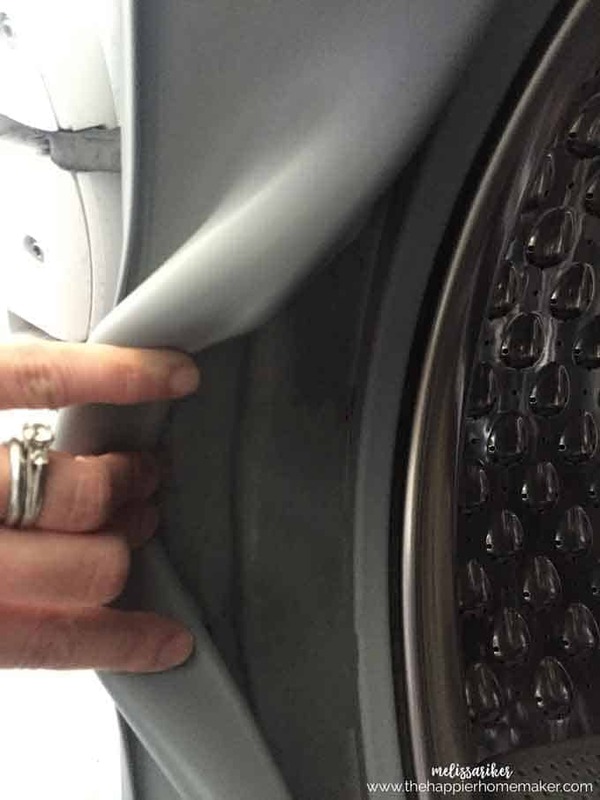 One of my most visited cleaning posts is this one on how to clean a top load washing machine. I’m often asked how to clean a front load washing machine but up until our recent move to England we had never had one so I had no chance to try various methods and report back on the best way. Luckily (or unluckily depending on how you look at it) I was given the chance to clean our machine as soon as we arrived-look at the condition I found it in! Gross right? It’s SO important to clean your washing machine!! 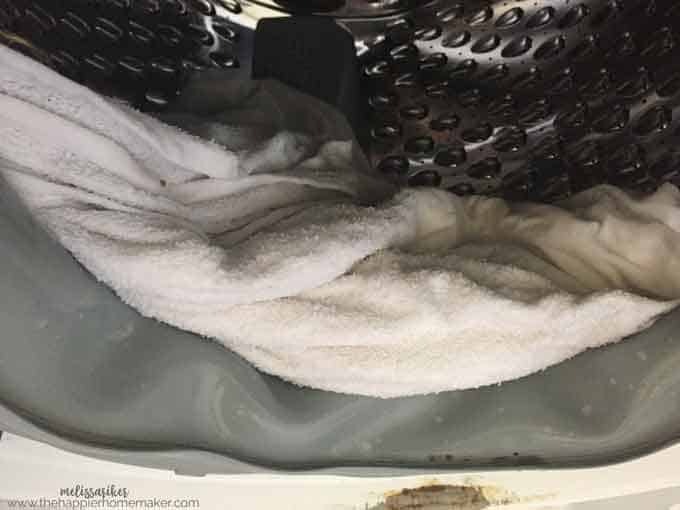 Not only were our clothes being rinsed with dirty, moldy water but my husband and sons are allergic to mold and were wearing clothes being washed in it! The first thing I did was grab the bleach-with mold build up this bad there was no other option. Soak some white towels in a 50:50 mixture of chlorine bleach and warm water. Tuck the towels into the rubber seal and let it sit on the mold and mildew for an hour or so. Then wipe out the gaskets-they should wipe clean at this point. Throw the dirty bleach soaked towels in the drum and run a wash cycle on the hottest wash cycle you have-usually the whites cycle. Pour two cups of vinegar into the drum and run another hot cycle. Next wipe the machine’s exterior with a 50:50 mix of white vinegar and water. Remove that detergent tray if possible and clean with hot water and vinegar as well. Thanks for your helpful advice. I’ve always left my door open after a load, but I never thought about leaving the detergent door open also. I’ve had good luck cleaning my front loader. Don’t forget to clean the inside of the detergent drawer while the compartments are removed! It helps prevent the mold from returning so fast. Thank you for your excellent cleaning tips!!! I will be using your cleaning tips for my front load washer. I enjoyed your blog. I Will use your cleaning tips on my front load washer. Thank you for the tips! I’m trying this on my disgusting moldy washer tomorrow! Thanks so much for the information and especially the pictures. This gives us a true idea of what we would be up against if purchasing a front loading machine. I want one so much because I am only five foot tall. I think this would be so much easier for me. But that mess would be a deal breaker if you hadn’t shown a good way to get it clean and keep it clean. I think this next time we will try the front loading machine and use your methods to keep it clean. An effective, non toxic alternative to chlorine bleach DOES exist: Hydrogen Peroxide. It’s extremely versatile – you can find lists of some of its many uses on Pinterest. I use it for my white laundry and to clean the gaskets on my front loader. No nasty smell!!! Thank you so much for the information and especially the pictures. This gives us a real idea of what we will face when purchasing the front loader. I want one very much because I am only five feet. I think this will be much easier for me. But this mess would be a bargain if you have not shown a good way to get it clean and keep it clean.